My name is Ed Smith. I am a Sacramento Mesothelioma Attorney that has helped numerous families deal with this horrific disease. What Is the Role of an Asbestos and Mesothelioma Lawyer? Mesothelioma is a rare form of cancer, in which malignant or cancerous cells are found in the Mesothelium. The Mesothelium is a protective sac that covers most of the body’s internal organs – and that is where cancer attacks. If you have been diagnosed with mesothelioma, and believe that mesothelioma was caused as a result of exposure to asbestos and that you have a claim for damages, please contact me today. Asbestos is a collection of naturally occurring fibers that are found in rocks and minerals. In the past, asbestos was heavily used in a variety of industries, primarily building and construction, because of its insulative and heat-resistant properties. While the use of asbestos is prohibited today, it was often used - and can still be found - in wall and attic insulation, shingles, roofing tiles, paint, fabrics, clutches, brakes, pipes, boilers, oil and coal furnaces, and walls and floors surrounding wood burning stoves, according to the Environmental Protection Agency. In many cases, asbestos continues to exist in old buildings and materials and may pose a risk of exposure and related disease in the event that it is disturbed. Asbestos products were used extensively in the 20th century in a wide variety of applications. Most of these products were directly responsible for a person’s exposure to asbestos. Both the individual who manufactured the products, as well as those who used them at commercial and industrial job sites including refineries, power plants, shipyards, steel plants and more, are responsible for causing mesothelioma. Because many of the products were used in home constructions, some homes can also contain asbestos. Even worse, many companies continued to use the products even after learning about the potentially fatal risks of asbestos. When asbestos was first used, the health effects of asbestos exposure were not understood. Today, we know that exposure to asbestos fibers can have devastating consequences, including the risk of developing lung disease/lung cancer, asbestosis, and mesothelioma. According to Cancer.gov, if a person is exposed to asbestos, it usually takes about 20 years for mesothelioma to develop. The diagnosis of mesothelioma, in all cases, must be established by a biopsy of affected or suspicious tissues, and by a definitive microscopic examination by a trained pathologist. The biopsy will require an invasive procedure such as thoracoscopy and pleural biopsy, or laparotomy or laparoscopy. The removed tissue may be treated with special biological or chemical stains which are used to help the pathologist establish a solid diagnosis. The pathologist will check the rate of growth and biological virulence of the tumor which must be staged if possible by X-ray, Cat scan, MRI or other types of scans to clarify its location within the body and also to estimate the likelihood of the effective curative or palliative therapy. However, the staging of Mesothelioma by X-ray is often unreliable. 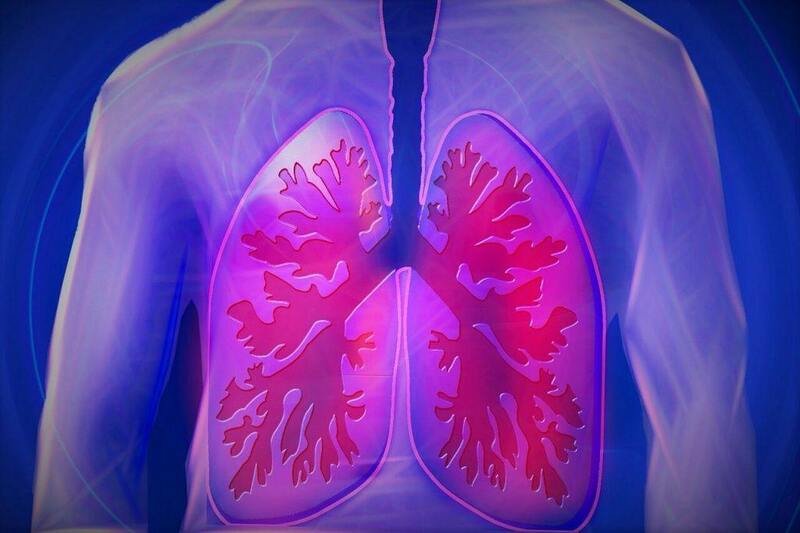 Malignant mesothelioma is a deadly form of cancer that is found in the mesothelium, which as referenced above is the layer of tissue that surrounds and covers the internal organs, and which is directly related to asbestos exposure. While the most common type of mesothelioma is pleural mesothelioma, which means that it is in the tissues surrounding the lungs, peritoneal mesothelioma - when the affected tissue covers the abdomen - is also possible. Malignant mesothelioma, as stated above, is a deadly form of cancer. Complications from the disease include pain in the chest, trouble breathing, aches and pains throughout the body, and fluid in the chest. A person who is diagnosed with mesothelioma will likely undergo intensive medical treatment, which in itself can be painful. The Mayo Clinic states that these medical treatments include surgeries to decrease fluid in the chest and remove cancerous tissues, as well as surgeries to remove a lung that is affected by cancer, chemotherapy, and radiation treatment. Sadly, even with aggressive treatment, malignant mesothelioma is not curable in the majority of cases. Because asbestos is a collection of fibers that are found in a variety of materials (listed above) that are present in homes, schools, offices, and places of work across the country, nearly anyone has the potential to be exposed to the fibers over the course of their lifetime. However, those who experience prolonged exposure are the most at risk of developing mesothelioma or another asbestos-related disease. Asbestos particles are distributed into the air, and then inhaled into the lungs, when they are disturbed. For example, demolition work of materials that contain asbestos can release the fibers into the air. If someone lives in a home that contains asbestos, their exposure to the fibers will likely be minimal unless the fibers are disturbed, such as during a home improvement project. Those who are most at risk of asbestos exposure, and therefore most at risk for the development of mesothelioma, are those who have been directly exposed to asbestos in their place of work. This includes mechanics, boilermakers, electricians, construction workers, demolitionists, machinists, laborers, manufacturers/factory workers, pipe workers, and sheet metal workers. This list is not inclusive. In addition to those who have been directly exposed to asbestos, family members of those who were directly exposed to asbestos may also be at risk. In many cases, asbestos fibers are carried home on the clothes of those directly exposed; after many years of this, the at-home exposure for family members can be significant enough to cause mesothelioma. Being diagnosed with mesothelioma, or watching as a loved one learns of their disease and goes through the treatment process, can be a very emotional and traumatic experience. For many people, taking all measures possible to prolong life and fight the cancer is desirable, even though this can mean painful treatments, huge medical bills, and a small chance of recovery. If you are diagnosed with mesothelioma, or if you lose a loved one to mesothelioma, you have the right to pursue civil action if you can establish the source of the asbestos and prove negligence. For example, if you worked in an industry where you were exposed to asbestos fibers for many years, and yet had no knowledge of the presence of asbestos or/and the dangers of asbestos exposure, you may be entitled to compensation. All other economic and noneconomic damages. In the event that you have lost a loved one as a result of mesothelioma, you may also be able to seek damages for loss of guidance and companionship, as well as compensation for funeral and burial benefits. One of the most difficult components of filing a mesothelioma claim is the duty that the plaintiff has to establish the cause of the mesothelioma and the source of asbestos. In fact, if causation cannot be established, a claim will not be successful (other components of a claim include establishing the existence of a duty of care, proving negligence and breach of a duty of care, and damages). Proving the source of asbestos and cause of mesothelioma will require an intensive investigation. Because many people who suffer from mesothelioma today were exposed to the asbestos fibers 20 or more years in the past, the investigation may include tracking down old employers and co-workers, gaining access to company’s testing records and materials lists, interviewing manufacturers and distributors, determining whether or not any other people in the industry/place of employment have developed an asbestos-related disease, and more. Proving causation will also require the expertise of medical professionals, who may be required to testify on your behalf. I work with a number of experts who can help to build your claim and provide professional opinions to the court regarding the cause of your mesothelioma. As an asbestos and mesothelioma lawyer, I have an important role in helping you to understand the claims process and the laws surrounding filing a civil action: investigating your claim, including the cause of your mesothelioma and the source of asbestos exposure; building the claim and consulting with experts; filing your claim; negotiating with insurance adjusters to recover the settlement amount that you deserve; and taking your claim to court and litigating when a settlement agreement that addresses the full extent of your losses cannot be reached. I am also here to support you throughout the entire process. I understand that you are probably facing a lot of fears about your future and that this sentiment is likely true whether you are someone who has been diagnosed with mesothelioma, or the surviving family member of a person who has died because of asbestos exposure and malignant mesothelioma. I work on a contingency fee basis. This means that I never expect payment for my legal services unless your case is won. If your case is successful and you recover damages, I will be paid based on a percentage of your winnings (the specific percentage is agreed to in advance). You will never be expected to pay a retainer fee or hourly fees, nor fees associated with an investigation and hiring experts; my law firm covers all of these upfront costs. I’m Ed Smith, a Sacramento mesothelioma lawyer. If you or your loved one is suffering from mesothelioma, or if you have recently lost a loved one to this tragic disease, please call me at 916.921.6400 or 800.404.5400 for free, friendly advice. If you prefer, I can also be contacted by way of this online form. I am a California Million Dollar Advocate. Advocates are top-ranked trial lawyers in the United States who have obtained multiple million dollar case verdicts and/or settlements on behalf of their clientele. I'm also a member of the Top One Percent, a National Association of Distinguished Counsel. See my long history of successful case verdicts and settlements. Please take a moment to look up my client reviews on Avvo, Google, and Yelp. Q. I was exposed to asbestos many years ago. How long does it usually take for asbestos exposure to result in mesothelioma? A. Typically, it can take 40 Years or longer. Q. Besides exposure to asbestos, is there any other factors that increase the risk of developing mesothelioma. A. Sometimes there is a genetic susceptibility. Also continuously washing and ironing clothes of someone working with asbestos increases the risk. People infected with simian virus 40 also have an increased risk. Can Motor Vehicle Occupations Cause Mesothelioma? Do Women Have a Favorable Advantage with Mesothelioma?